If you are only looking at recent history, this might be true, but there’s another that had more casualties than both of these together. In it, over 150 men, women, and children were killed. Unlike the two more recent shootings, it wasn’t the work of one shooter, it was done by the U.S. military and the victims were the Lakota people. 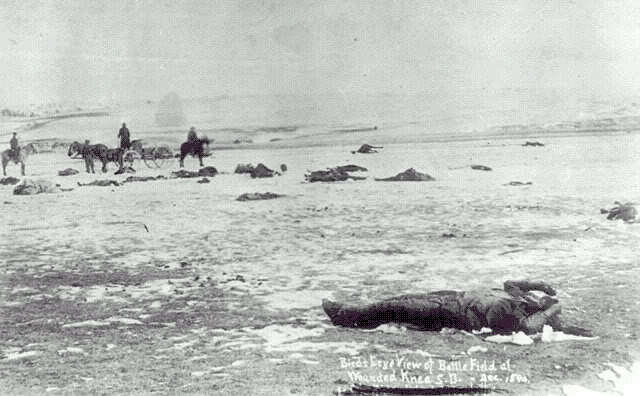 It was the Wounded Knee Massacre. In December of 1890, the 7th Cavalry Unit of the U.S. military went to Lakota reservation to take away the guns from the Lakota people. The Lakota had been bison hunters, but the numbers of those animals had been reduced by the U.S. military in an effort to starve out the people who were dependent upon them as a food source. The reservation land they had been granted had been reduced to a smaller and smaller area by white settlers and gold miners. One story of the event says that a man named Black Coyote didn’t want to give up his rifle since he had paid a lot for it. His reluctance led to a scuffle, shots were fired, and then the massacre followed. Whether this is true or whether the Lakota just decided that they needed to make a stand, we can’t really know but it’s something to keep in mind when you hear someone say that we would be better off if only the government, and not the people, have guns.